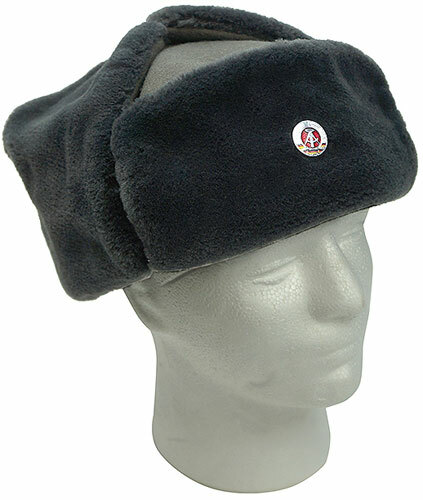 These cold weather caps were made for the East German military, and are a gray wool blend with nylon faux-fur on the front and the standard pin-up ear flaps. New surplus from the late 1960s. 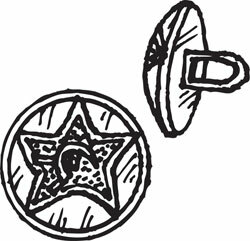 Front has a 3/4” dia hammer & compass cloisonné medallion, the erstwhile symbol for E. Germany, that is just pinned on so you could wear it with anything! Size is Euro 576, which is a medium. 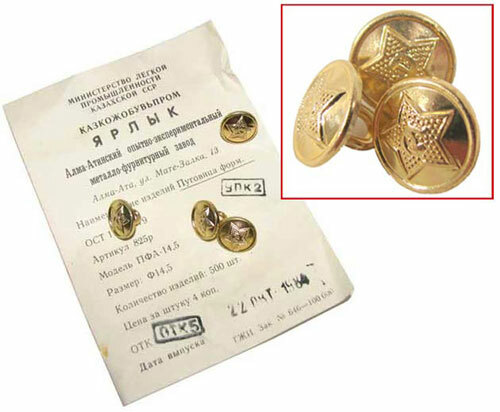 That’s where these military overseas caps started out, on Deutsch köpfe. 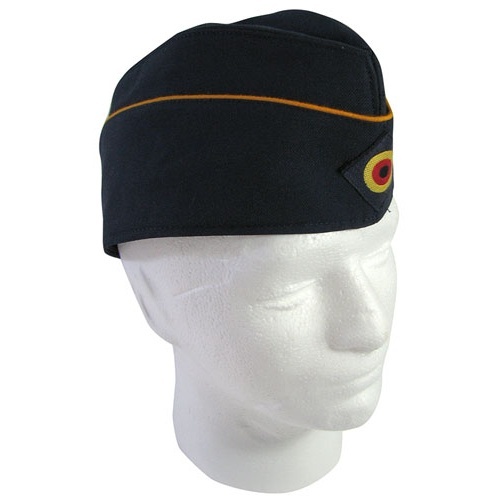 Slightly shorter than the U.S. garrison cap, and with a jaunty curve, front to back, they’re in dark blue-gray with orange piping and a German army insignia on the front. 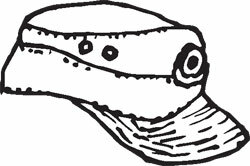 We’ll pick a pair in (2) different sizes 58-63, which is approx 7-1/4 to 7-7/8 on American heads, but the envelope design gives them some size leeway. 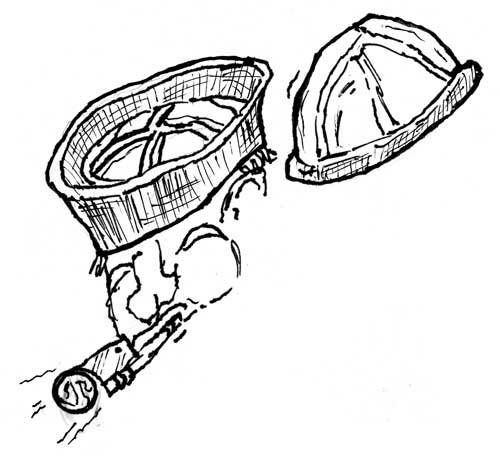 With Austrian troops climbing ev'ry mountain and wearing these fatigue caps. 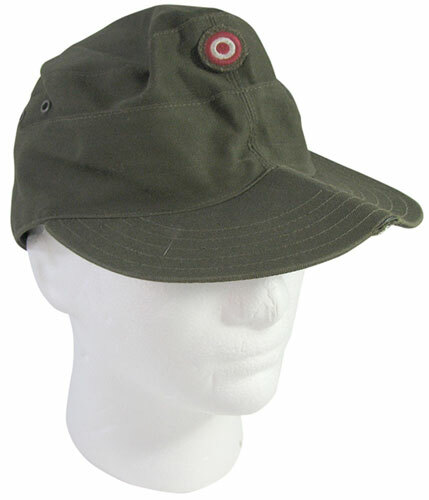 In dark olive drab, with little vent holes and that Austrian army target-like red and white circle logo on the peak. Pre-worn in Austria for your convenience. In Euro size 54/55, which is US small, 6-3/4 to 6-7/8. 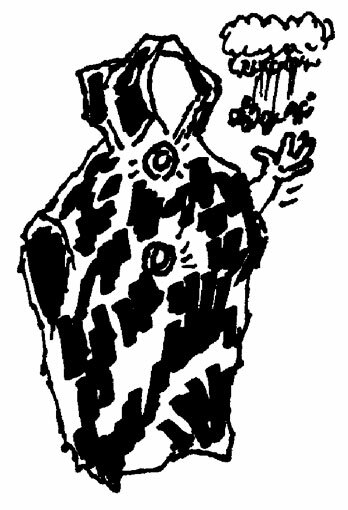 In a material like extra-thick trash-bag plastic, this is a late 1960s Swiss military Nuclear/Biological/Chemical protective poncho. Measures approx 50” long x 38” wide with snap closures in the front. 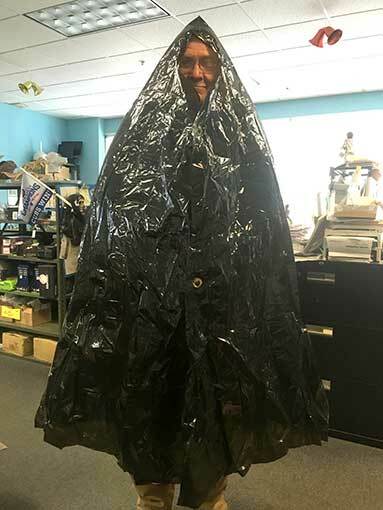 We’re thinking it’d be handy for sudden rain storms but we’re a tad skeptical about its effectiveness in the case of nuclear rain. Best check with Switzerland before going out in the fallout. Like the ones Johnny Carson wore? No, like the ones the Swiss military uses to handle Nuclear, Biological or Chemical stuff. NBC. 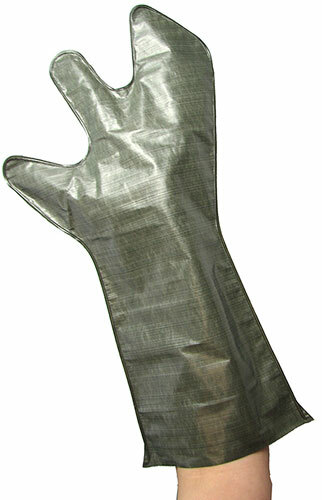 These are new, still in the package, olive drab-ish, in a mysterious plastic-like material, 18-3/8” long x 7-1/2” wide, and are constructed like mittens with index fingers, the better to free up your trigger-finger, we assume. Our each is (3) pairs, complete with rubber loops to secure them to your forearms. When worn, they give you an (uncooked) lobster-like appearance, so costumers take a hint. 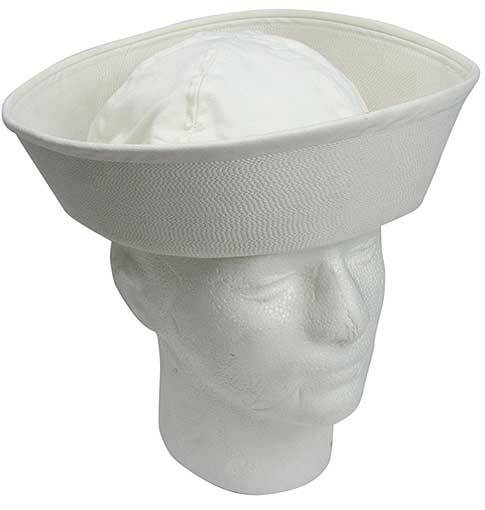 From the U.S. Navy stock of unused Gob hats (no, we don’t know where that name comes from) or more familiarly “dixie cups,” in white cotton twill. 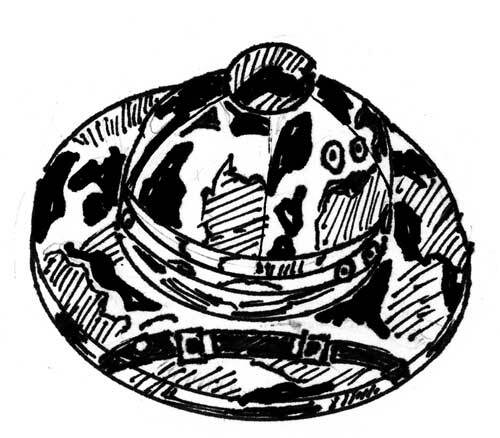 We’ll pick from sizes 7 through 8-1/2 if you’re going for the Cracker Jack look, but if you turn the sides down like Gilligan, one size fits every noggin. Upright, it should be squared up for authenticity. Group discount available for drama teachers staging South Pacific. Yeth, it’s just pithiful. 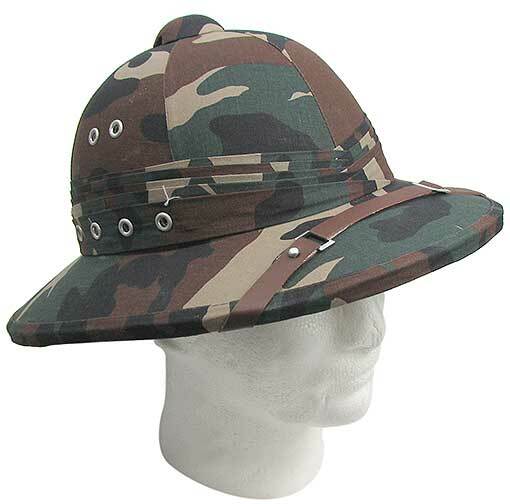 These authentic-looking pith helmets have a woodland camo pattern that goes with everything.Inside, it measures appx. 8" x 7" x 4-1/4" deep, and the brim measures a 14” x 11-3/4” oval. 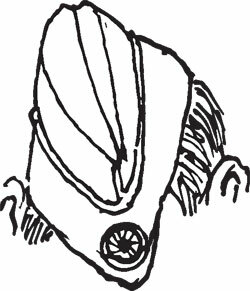 The name comes from the fact that these helmets were originally made from the pith, or spongy insides, of the stem of the shola plant. Use that trivia at your next dinner party--while you’re wearing one of these helmets. Made in Vietnam. Survival bracelets, actually. 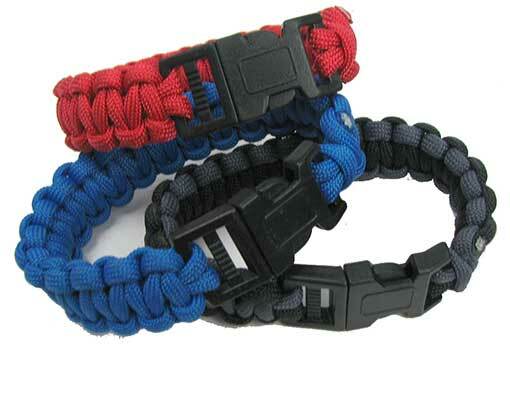 These are braided paracord, and quite attractive, but unbraid them and you’ve got (7) feet of military grade (per the mfr) paracord with a safe working load of 100 lbs and a max working load of 550 lbs. 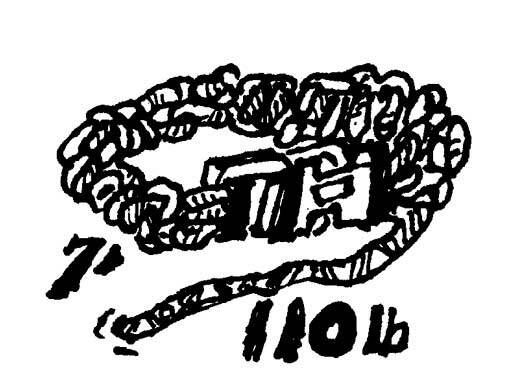 Bracelet closes with black snap closures. Mildew and abrasion resistant. In black, royal blue, red, purple-ish gray with black edges, and camo. We’ll pick, but order two or more and we’ll try to send different colors.